ISE Learning Commons: What's happening at the library? Lower school students have weekly library classes. Look what we are learning about! Preschoolers are enjoying fairy-tales. By listening to three popular fairy-tales: Three Little Pigs, Little Red Riding Hood, and Goldilocks and the Three Bears we will learn that every country has stories that are so old; people cannot remember where they came from. These stories have been kept alive because they have been told over and over throughout history. Long time ago when people did not have books, radios, TVs, or computers stories were told for fun and entertainment, but also to teach a lesson or warn children of danger. Because there were no books and people could not read and write; stories spread by the word of mouth. Stories were told to one another over and over again. Nowadays popular fairy tales are written down in books for children and grown-ups to enjoy. Reception class is learning about fiction and non-fiction. Fiction books are made-up and imaginary. Non-fiction books are true, about real things. We are sorting books, and looking at what makes a book fiction/non-fiction. Grade 1 is learning that books just don't happen. Author writes the story we read, and illustrator creates the pictures we see in the book. We are also looking where you can find the author's and illustrator's name in a book? Grade 2 created collaborative non-fiction book “Grade 2 in Prehistoric Times” while learning about parts of a book, how each part can help you to get different information and copyright. 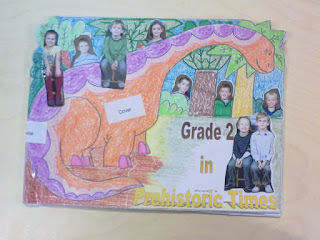 Each student created a page for the book by first reading a small paragraph about a dinosaur, then writing a sentence about it and finally marking down the source of this information. The librarian, with the help of students assembled the book, students labeling all the parts in that book. Our book includes the title page, table of contents, glossary and the index for easier access to information. Now we are learning how fiction and non-fiction books are arranged in the library. Grade 3 knows how to look up books using ISE Online Catalog, and practicing where the specific books are on the shelf. At the moment we are getting acquainted with the 10 Dewey sections of the library. Do you know in which section are the books about animals/sports/famous people? 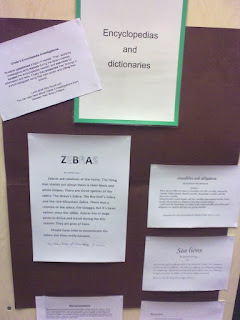 Grade 4 has discussed the following topics: how to use dictionaries and thesauruses in the writing process; how to be a responsible cyber citizen; how are the library resources arranged in the library for independent access. Students are becoming more and more confident in finding their way around the library. Grade 5 completed an encyclopedia investigation which took us discussing and learning about plagiarism and citing sources. We are getting ready for their final exhibition by also looking into Online databases, finding information online and evaluating websites. I recommend our upper school students to check out the following titles available in the library "Moribito I and II" by Nahoko Uehaski fantasy and adventurer lovers, and Axel Rider series by Anthony Horowitz for action and spy story readers.